The Sweep2 command fits a surface through a series of profile curves that define the surface shape and two curves that define the surface edges. 1. Select two curves as the rails. 2. Select cross-section curves in the order in which the surface will pass through them. Note: Select open curves near the same ends. For closed curves, adjust the curve seams. ● Make the degree and structure of the rail curves match each other. ● Place cross-section curves so the endpoints are on the ends of the rails or on edit points of the rails. ● Turn on edit points and use Point object snap to place the section curves between matching edit points on the rails. ● If only one section curve is used, the entire length of the rails are used for the surface, regardless of the settings. ● Section curves can have differing structures. The surface takes the complexity of the most complex one. ● To use same shape curve in the whole sweep, with control over where the sweep ends, use the Orient commands to create a scaled copy of the shape curve and place its ends at the places on the rail curves where you want the sweep to stop. 1. Select a seam point marker, and move it along the closed curve. 2. Continue to adjust the seam points until they line with each other and the closed curves all have the same direction, and then press Enter. 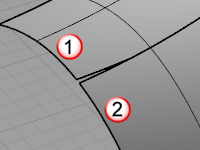 Attempts to align the seam points and directions without intervention. Moves the seam points to the way they were at the beginning of the command. Creates the sweep without altering the cross-section curves. Rebuilds the cross-section curve's control points before creating the sweep. Refits the cross-section curves before creating the sweep. When you are matching edge tangency or curvature, your surface may pull away from your cross-section curves. This option forces the surface to match the first cross-section curve. When you are matching edge tangency or curvature, your surface may pull away from your cross-section curves. This option forces the surface to match the last cross-section curve. Removes the association between the height scaling from the width scaling. By default, cross-section curves normally scale in both the height and width dimensions. Refits the rail curves before creating the sweep. Continuity is only enabled if the rails are surface edges and the shape curves are non-rational, that is, all control point weights are 1. Exact arcs and ellipse segments are rational. Note: Only continuity options that the curve structure (point count and rational/non rational) supports will be available. Sets the continuity for the edge match. Adds additional cross-section alignments to control how the surface is created between sections. Fit a surface through profile curves and one edge curve.